Captcha Bank always stays at the forefront of spam and abuse. It works as a guard for you, protecting your WordPress site so that you can rest easy. What a Captcha can do for you? Captcha provides you the security from various attacks on your WordPress website. It prevents the site by blocking the users exceeded the maximum failure login attempts. Captcha gives almost 100% spam protection guarantee to your website. Sometimes, filling captcha can be annoying but it is a price you pay to keep your website free from spam. Captcha is a modern technique used to ensure website security. It helps to secure your websites by preventing undesired access, while still allowing access to an authorized user about data & information. You can block users for a temporary period of time when exceeds the maximum numbers of login attempts, mostly occurs when a user tries to log in with the random passwords. Simply go through the series of steps to configure Captcha on your website. Make your captcha more effective by using logical operations. Logical Captcha asks some logic based question these logical questions are based on simple mathematical operations. Arithmetic Operations like Addition, Subtraction, Division & Multiplication. Relational Operations like Largest & Smallest Number. Arrange Order like Ascending Order & Descending Order. Text Captcha is mainly a collection of distorted images with alphabets or numbers. You can modify the Captcha by changing its interior or outline, or by adding effects. In Text Captcha Setting you can customize your Captcha by styling it with different patterns, text styles, alphabets & digits, transparency, noise level & much more. Google reCaptcha is a technique to detect bots or computers with the collection of distorted images or audio. Google checks the mouse movements that make a difference between a human and bots. It also uses Google Analytics & Google Adsense algorithm. Captcha Bank also allows you to set Google reCaptcha themes on your website and Google reCaptcha is supported in almost every language. Blocking an IP is an act of security used on the web to block connections from a specific IP's that are undesirable. We provide you option for auto IP blocking. In Captcha Bank, you can block those users who exceed maximum login attempts for a temporary period of time. To protect your site from spammers you can block IP for Maximum Time Duration it should be in hours, 1 week, 1 month & Permanently. 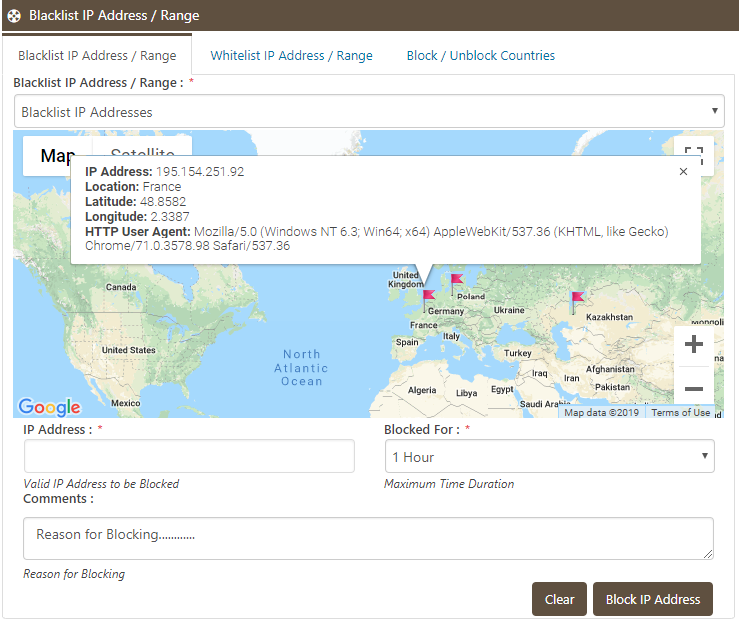 To protect your site from spammers, you can find the IP Addresses / Ranges which are trying to access your site at a certain interval and block those selected IP Addresses / Ranges. Captcha Bank plugin gives you the ability to Whitelist IP Addresses. You can decide who will view and access your website. Unauthorized IP’s won’t be able to scrap the precious content from you. 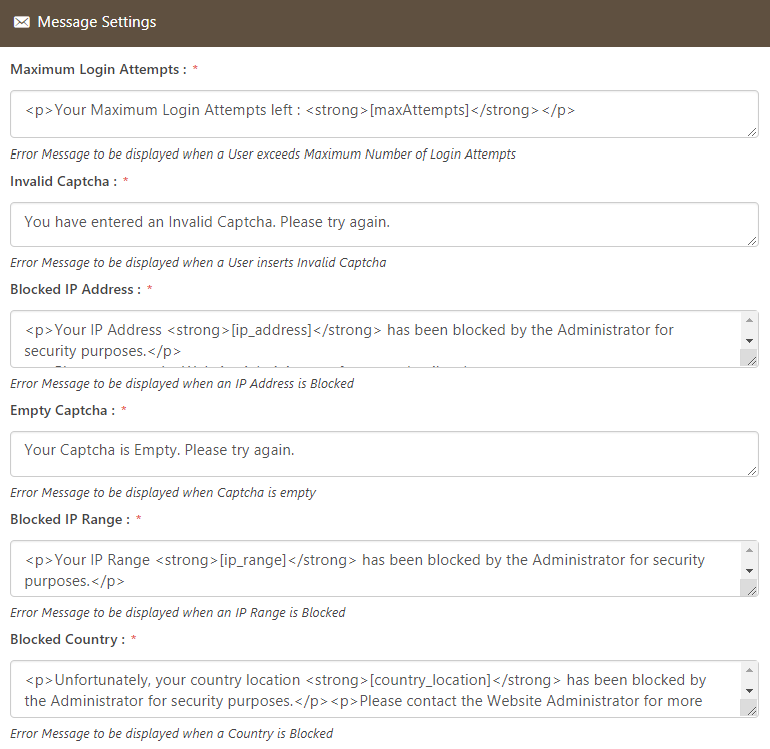 We can help you block the Spam and Hacking attempts from certain countries. 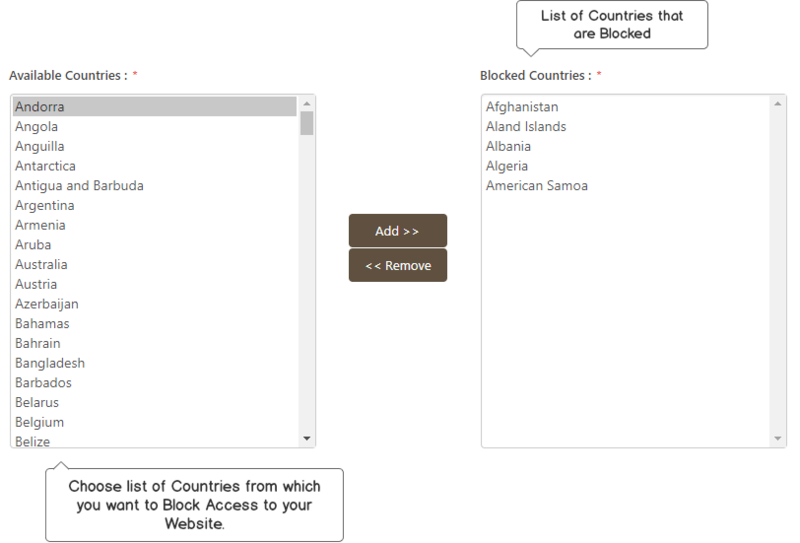 We give you an option to choose the list of countries from which you want to block access to your website. 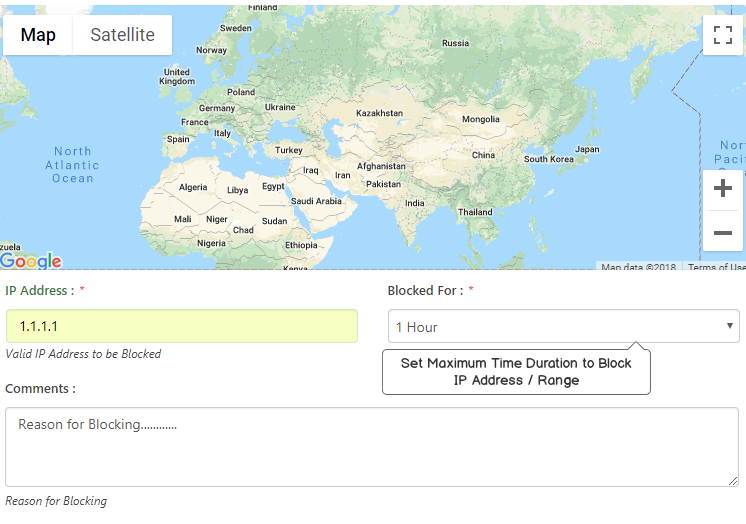 With this you would be able to block/unblock countries and can also manage the blocked countries IP. Captcha Bank shows you the location of the IP on the map that you have added to the Blacklist and the Whitelist. 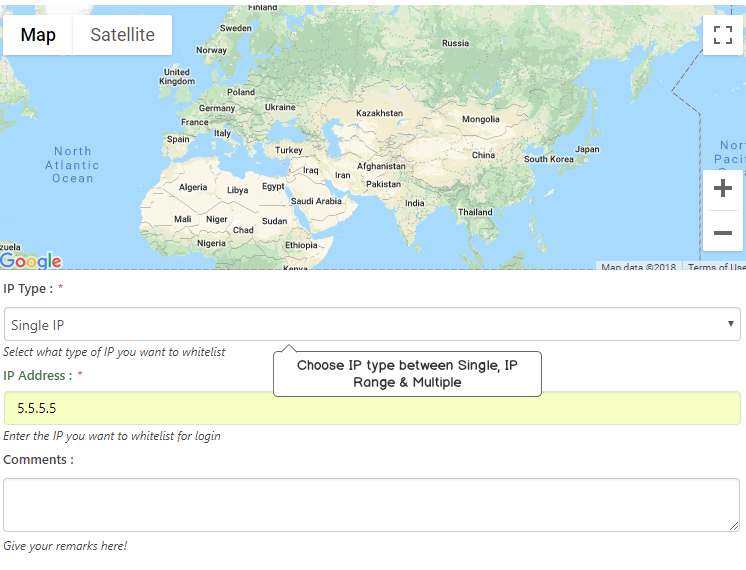 The map view shows an info window that gives information about the IP and its location. By this, you can easily detect Blacklist / Whitelist IPs. 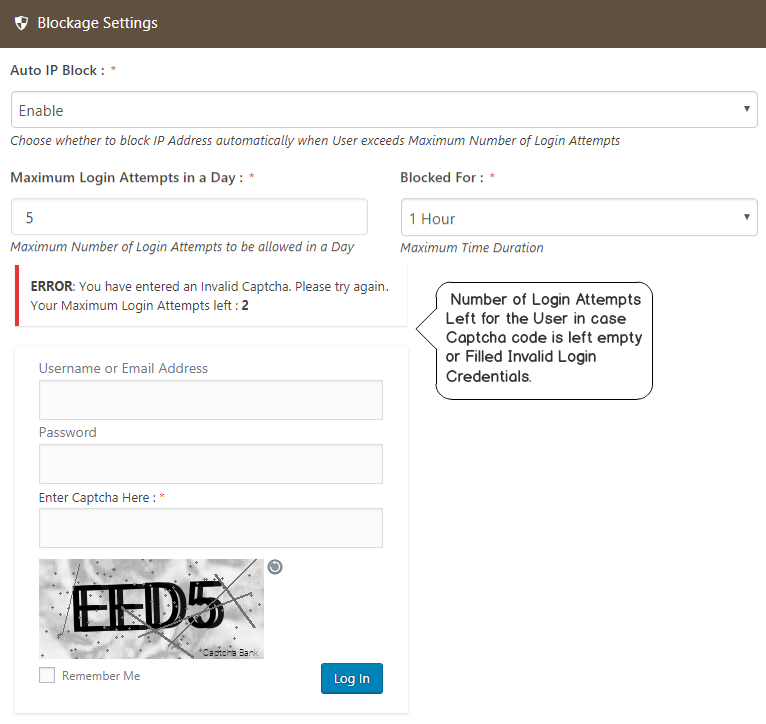 In Captcha Bank, the administrator gets notifications when different events occurred on your website whether any user successfully Login or log out & any of the IP's block / unblock. Captcha Bank gives you the freedom to add your own custom error messages, that what message will be displayed on which event. You can also apply styles to your Custom Error Messages by applying some common HTML Tags like strong, Italic etc. Captcha Bank allows you to monitor your IP status thoroughly. 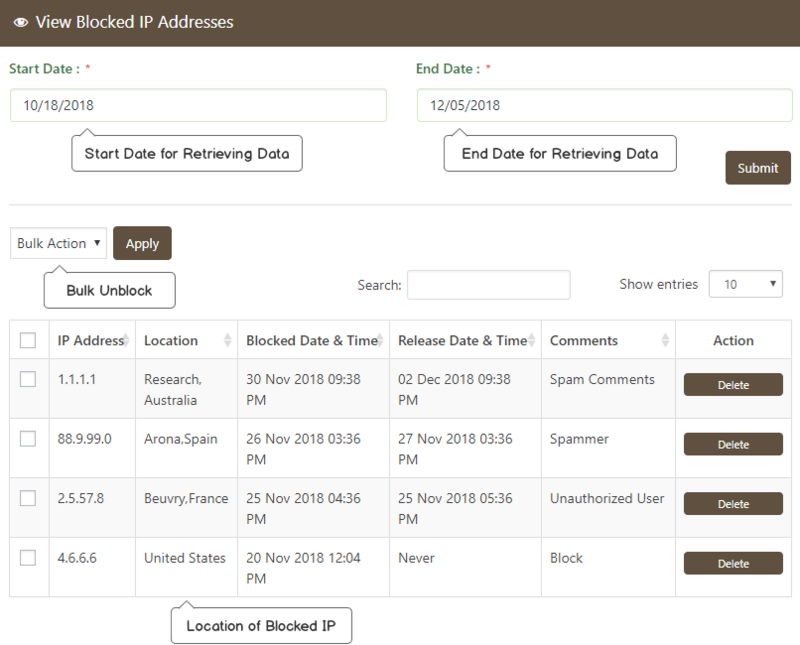 All Blacklist & Whitelist IPs are listed with blocked and released date time status. You can also retrieve IP data on a monthly, weekly, & yearly basis. Captcha Bank is fully compatible with other Plugins on which you can use the Captcha Security efficiently. Captcha Bank is fully compatible with Contact Form 7 to protect you from spam emails. Captcha Bank allows you to add captcha to WooCommerce Login Form, Registration, Reset Password & Checkout Form. To secure bbPress Login Form, Reset Password, Registration & New Topic Form use Captcha Bank. 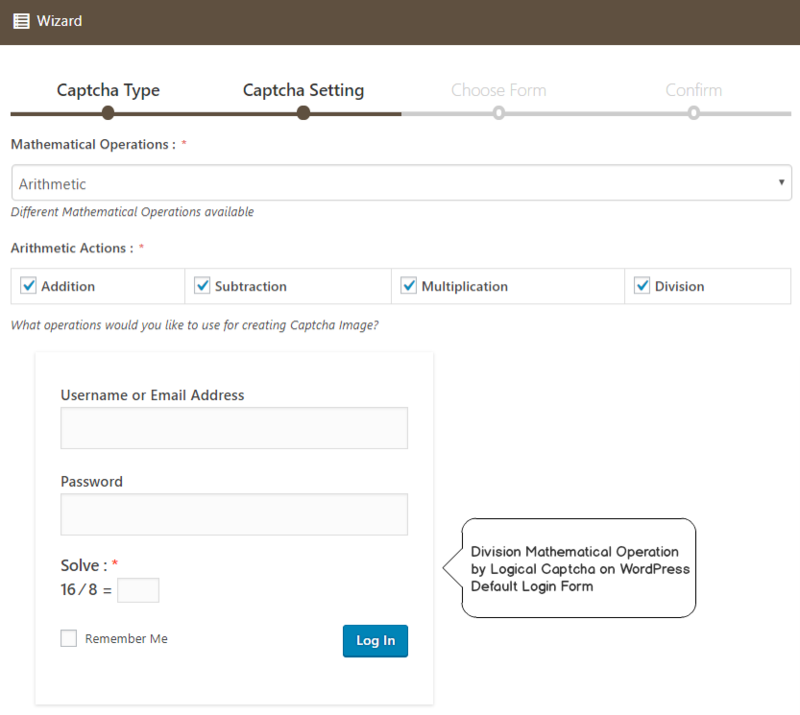 Captcha Bank provides more security to wpForo Login Form & Registration Form. 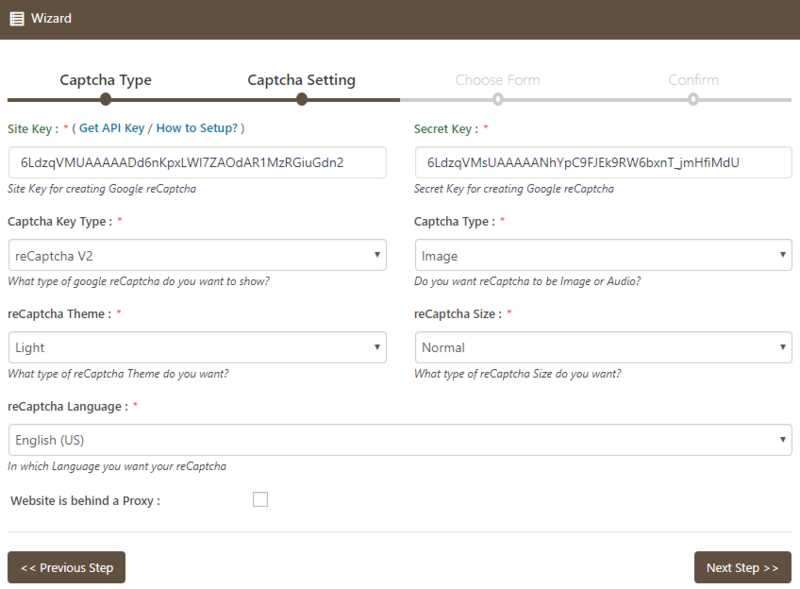 Captcha Bank creates more reliable and secure BuddyPress Forms. Increase your form security by adding Captcha to your JetPack Contact Form. 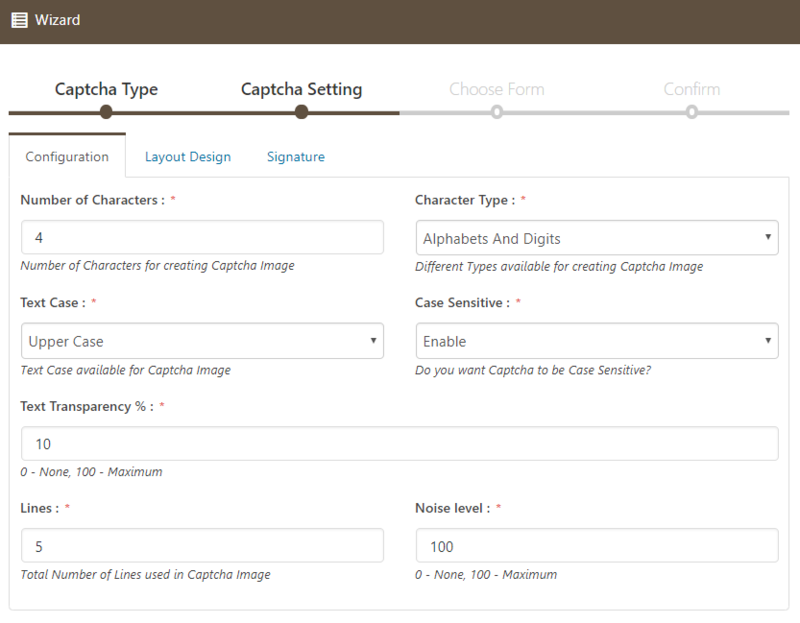 Secure your default WordPress Forms with the Captcha Bank. Do you have a question about Captcha Bank? See the list below for our most frequently asked questions. If your question is not listed here, then please contact us. On How Many Sites Can I Use Captcha Bank? You can install Captcha Bank on Unlimited Sites. You will get a notification about the Captcha Bank in your WordPress Back-End whenever an update is available. You can expect that Captcha Bank will get improved, optimized, and bug-free plugin every time you will update. Captcha Bank Pro Edition offers you Full Features, Support & Updates for Unlimited Sites. Captcha Bank Developer Edition offers you Full Features, Support & Updates for Unlimited Sites with Contact Bank, Backup Bank, Gallery Bank & Coming Soon Booster Pro Edition. Whereas Agency Edition offers Full Features with Support & Updates for Unlimited Sites with Contact Bank, Gallery Bank, Coming Soon Booster, Facebook Like Box, Google Maps Bank, WP Mail Bank, Limit Attempts Booster & Clean Up Optimizer Pro Edition. Lets make your WordPress website more secure and spam free.